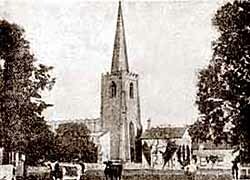 The church of St Mary Magdelene, Attenbrough in the 1920s. General Ireton's birthplace is the house to the right of the church. ATTENBOROUGH is a small rural parish, with a little station on the line between Nottingham and Trent, and attracting such notice as is given to it by a majority of those who travel past from the peaceful isolation it apparently enjoys. Seen at a distance, the parish church appears an edifice of fine proportions; its curious sculpture on the piers, which support the arcades between the aisles, its picturesque surroundings and well-kept churchyard, will not fail to be observed by those who visit it. But none of these things, interesting though they be, would have given Attenborough more than local fame. It rests its claim to a wider celebrity on a more solid and unique foundation. If we turn to the old parish registers we shall find therein that, early in the seventeenth century, there was living at Attenborough one German Ireton, gentleman, to whom sons and daughters were born. The Iretons were a Derbyshire family, and had held property at Little Ireton, from which village they took their name. German Ireton purchased a lease of the rectorial of Attenborough, and took up his abode in the house adjoining the west end of the church. His eldest son was born in 1611, the entry of his baptism being as follows: Henricus Ireton, infant Germani Ireton, baptizat fuit 30 die mensis Novembris An. 1611. It was the Henry Ireton here mentioned who became the son-in-law of Oliver Cromwell, and rose to be one of the most famous of the Parliamentary Generals. Another of the children of German Ireton born at Attenborough became Alderman, and subsequently Lord Mayor, of London. A house, which seems to have been much modernized and is now used as a farmhouse, still occupies the site of Iretons dwelling, and is known among the villagers as Cromwell House. German Ireton, father of these two notable men, died in 1624, and was buried at Attenborough. The life of General Ireton is well known to all readers of English history, so that it is needless to recapitulate it here; but that of his brother, the Lord Mayor, is more obscure. He was knighted by Cromwell, and purchased the estate of Radcliffe-on-Soar, in Notts, from Colonel Hutchinson. At the Restoration, when his brothers remains were exhumed, he was seized and thrown into prison, an allusion to which circumstance is made by Pepys in his Diary, under date December 1, 1661. According to a letter in the State Papers, he was removed to the Scilly Islands; but if this be so, he was shortly after liberated, for in a list of thirteen fanatics at East Sheen, in 1664, where conventicles were innumerable, is the name of John Ireton, Formerly Lord Mayor. He was again imprisoned for seditious practices, and, dying in 1689, was buried in London at the church of St. Bartholomew-the-Less. A few miles further to the south, nearly on the borders of Derbyshire and Leicestershire, is the village of Kingston-on-Soar, and in its little church is a memorial that is decidedly unique, alike in design and execution. 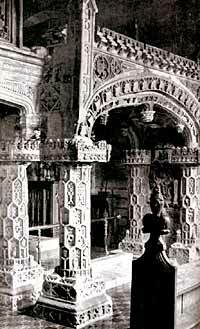 It consists of an elaborately-carved canopy supported on decorated pillars, which is said to have once surmounted a tomb wherein lay members of the ancient family of Babington, lords of Kingston and other villages in this county. There is no inscription on any part of the canopy, but round the capitals of the pillars are carved numerous babes with their bodies half hidden in tuns or casksa common monumental rebus on the family name, Bab-in-tonand a large shield with the family crest. Throsby says there are two hundred of the babes in tuns on the monument, while the arms are those of families with which the Babingtons were intimately connected. The highly ornate Babington Chantry dates from c.1540 and is an "altogether uncouth, if thoroughly meaty, provincial work" (!) according to Pevsner. The family to whom the erection of this singular memorial is due had, according to Thoroton, a very fair house here, which stood in a large field near to the church. Among the earliest owners of the village prior to the advent of the Babingtons were the Picots, lords of Radcliffe-on-Soar; William Seman, who did homage and fealty to Sir Peter Picot; Reginald le Joit; and Henry le Hauker, the latter having a messuage and sixty acres of land in Kingston of the King in capite by the service of carrying a falcon before him in winter. The Babingtons are supposed to have taken their name from a place called Babington in Northumberland, where they had resided from the time of the Conquest. At what date they removed from their northern abode to Nottinghamshire we cannot say, but there was a John Babington residing at East Bridgeford in the time of Richard II. The family continued at Bridgeford until the death of Sir John Babington, 16th Henry VII., when the manor passed to his sister, and through her daughter to Lord Sheffield. One of the sons of this Sir John was Sir William Babington, who presided for thirteen years as Chief Justice of the Common Pleas, and on his death, in 1544, was buried at Lenton Priory. Descended from the first John Babington of Bridgeford, who had five sons, were the Babingtons of Dethick (Derby), and it was this branch of the family that acquired Kingston. Perhaps the most remarkable, and certainly the best known, of those who lived at Kingston was Anthony Babington, the friend and supporter of Mary, Queen of Scots, who lost his life through his ardent devotion to her cause. Babington was a stanch Roman Catholic, and, like so many others of the same faith, was anxious to see the Scottish Queen supersede Elizabeth on the English throne. His partizanship was stimulated and strengthened by his admiration for the Queen herself. He was a comely youth, scarcely eighteen years of age, and the charms of the beautiful monarch made a deep impression upon him. On coming to London in 1580, he united himself with the influential admirers of the Queen, and became a member of a secret society for maintaining Jesuit missionaries in England. In 1585 he went on the Continent, and after his return was induced to participate in a conspiracy which had for its object the assassination of Queen Elizabeth, and the uprising of the Catholics in favour of Mary Stuart. The plot was discovered, as well as some correspondence between the Queen and Babington. He fled to Harrow, and thence journeyed to his native county. The tradition is still current at Kingston that he was securely hidden for awhile on the top of the sculptured canopy in the church. 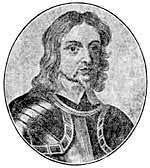 Sir Thomas Fitzherbert was accused of harbouring him at Derby, and of allowing Mass to be said at his house. After being tried and condemned, Ballard, Babington, and five other conspirators, were executed in St. Giless Fields, but the estates of Kingston and Dethick were permitted to pass to the brothers, Francis and George. Thoroton, speaking of Kingston, says, This manor, by the attainder of Anthony Babington, and the unthriftiness of Francis, his brother, afterwards came to the hands of Gilbert, Earl of Shrewsbury. Subsequently it was disposed of to Lady Hide. In memory of Edward Strutt, first Baron Belper; born Oct. 25 1801 ; died June 30, 1880. "Keep innocency and take heed unto the thing that is right: for that shall bring a man peace at the last" (Ps. xxxvii. 38). In the same district as Kingston, between Nottingham and Loughborough, several interesting villages are situated. From the Ruddington Road there may be seen a fine panorama of Nottingham and the rich valley of the Trent, while far and wide stretches a well-wooded landscape, with diversified views of hill and dale. At Bradmore there is a tower and steeple, the church itself having been burnt down many years ago and never rebuilt; but on its site a small mission chapel has been erected. Gervase de Somerville was one of the early owners of Bradmore, and at a later period the manor came into possession of the powerful family of Willoughby, and it continued with them until the time of Queen Elizabeth, when it was sold to Richard Parkyns.